On Friday, I had drinks on a sailboat with two of my favorite work biddies. One lives in DC and was just in town for the day so we had to pick somewhere special. Luckily, Grand Banks Oyster Bar has been docked on Pier 25 for a few weeks and has been all the rage. Drinking on the water is one of the best things about summering in NYC. When we walked down the pier and saw how crowded the boat was, we thought we were in for a long wait, but we were on the water within an episode of Full House. Someone I knew had walked off the boat while we were waiting and suggested we use her reservation for the tables once we got on board, so we beat the system and were seated after another twenty minutes. You can't be at an oyster bar without eating oysters, but we were more in the mood to drink and giggle than eat. M & I each tried one of the Mermaid Cove oysters, from Prince Edward Island. These were a little more briny than I thought they'd be, but still pretty tasty. N went for a smaller variety, which I think was the Tomahawk from Shinnecock Bay out in the Hamptons. We also split the Fried Baby Zucchini, which may have been my second vegetable serving of the week. While the food was good and the drinks a plenty, the atmosphere of Grand Banks is really what makes it - the breeze blowing your hair in your face, the boat rocking you, Mama, like a wagon wheel, and the gorgeous views of downtown Manhattan. What I enjoy most about working in Tribeca are the beautiful sunsets over the Hudson and New Jersey. I see more sunsets in the winter when the timing fits in with my work schedule better, so I hadn't seen one as pretty as this in a while. It could have been difficult for me to sleep that night, due to some unforeseen events right afterward (one involving me falling up the subway stairs and injuring my foot), but the rocking I still felt from the boat helped lull me to sleep eventually. If you find yourself downtown before this boat sails off to its next destination, walk down Pier 25 and experience this dreamboat yourself. I work *right* there, so remember to invite me. Don't be shellfish and forget. Full House Trivia?! Have Mercy. About 10-15% of my brain capacity is devoted to remembering episodes of Full House. I've wanted to go to Full House trivia for a while (you all know how much I love trivia) and when the opportunity came up this Tuesday, I had to take it. I also knew I had to go with Kristyn because we have never had a lunch, dinner, or happy hour where we don't discuss minute details of this fantastic (?) show from the '90s that framed our childhoods. Our team on Tuesday was rounded out by Frousin Em and her fab friend Marathon Caitlin. The competition was at Copia on 53rd and 2nd and was hosted by TriviaAD who also present Friends, Seinfeld, and Mean Girls trivia, among several other varieties all around town. Caitlin came up with our team name of "Viper's Ripped Jeans" and we breezed through the first round as easily as Nicky and Alex breeze through the Tanner household destroying everything in their path (including Michelle's solar system project). Who co-hosted "Wake Up, San Francisco" with Danny when Becky was on maternity leave? Vicky Larsen. What was the cereal DJ did a commercial for (which Stephanie later stole from her)? Oat Boats. What did Becky do on-air to show she was brave? Bungee-jump off a bridge. During the second round, we were given 10 quotes, read without any inflection, and had to identify who said them. These were a little harder because you had to think really hard about which episodes they were from or who they sounded most like if you couldn't think of the episode. We went back-and-forth on a few of these, but we got some of the difficult ones and only missed 3 out of 12 in this round. I think that we got either 9 or 10 of the 10 true or false questions in the third round. We also were so clever (cocky?) that we gave the reasons why any questions were false on the back of the sheet of paper. For example, when Danny auditioned for Jesse's band, he did NOT use the nickname of "Dirty Dan," he used "Mildew." I don't think we got extra credit for this. For the fourth round, we received a paper with 10 pictures of characters from the show, most of them only appearing for one or two episodes. Some came to us without a second's hesitation: Stavros, Jesse's creepy Greek cousin who sexually harassed Becky; Brett Brett, Brett Brett, Stephanie's crush on the opposing baseball team; and Rusty, the trouble-making son of one of Danny's girlfriends, who we all had a thing for when first watching the show in the '90s. But then there was the woman Danny was paired up with when Vicky couldn't show up to their version of the Newlywed game - we all knew it was an old lady's name that started with "E" but couldn't come up with the right answer of "Estelle." There was also the female comedian who Joey dated named Roxy, but Emily and I both said "Allison" at the same time for some reason so we chose that answer. And dear Aunt Ida, who we couldn't think of for the life of us. The last round, the "Lightning Round," was where we fell apart and had to guess at the majority of the questions - how many jars of Honey Bee honey did DJ sell when she was a Honey Bee? How much did Becky pay for Uncle Jesse at a bachelor auction? What was Steve's ex-girlfriend's name? I suddenly felt like Michelle after she thought she was doing well in her soccer game but it turned out she was scoring for the wrong team, but these 20 questions were meant to test you. Disclaimer: After writing this post and remembering how much fun I had, I was inspired to reach out to the owner of TriviaAD to see if I could join the team at TriviaAD. I have since started working for the company on the side, hosting and scoring trivia nights at different establishments in NYC. Come check us out! Sometimes I have an obsessive personality. In 7th grade, it was Beanie Babies. In 9th grade, it was 'N Sync. So far this month, it has been the New York Magazine Cheap Eats issue. I'm talking OBSESSED. As in, I may have made my own spreadsheet with categories of Borough, 'Hood, Cuisine, and what the magazine suggested to order there. If you are nice to me, maybe I will share, if you then promise to go to one (or several) of the establishments with me. The Cheap Eats issue is nothing new, but this year NY Mag did something a little different. They ranked the 101 Cheap Eats selections for the first time in 8 years but also only included restaurants that had opened since the last ranking. Here is a sampling of a few I'd tried prior to this but also some I just *had* to try this week. I happened to share my obsession with the Cheap Eats list with the right person at work. He lives near Black Seed Bagels and brought them in on Friday. Friday mornings are usually difficult for me, but this Montreal-style bagel made this one a lot easier. Montreal bagels are smaller, larger-holed, and way more dense than New York bagels so they may not be for everyone, but I enjoyed the surprise for sure. Saturday's Smorgasburg treat was a sandwich from Porchetta. Considering how long the lines were at some stalls, I was surprised when I walked right up with no wait, but maybe not everyone in the city read this NY Mag with as much focus as I did. I first had a porchetta sandwich in Philly in the fall so I knew I'd like this one. While it was good and just what I needed right then and there, I couldn't help but wonder if the storefront had something better to offer that made the NY Mag editors think this belonged in the top 10. I felt like it was missing something, like sauce or cheese. Caitlin took me to Parm sometime last year. At this moment I can't remember if I ordered a chicken parm or a meatball parm but I do remember enjoying it a ton. Since I can't remember which sandwich I got, I think this place is worth a revisit. No Parm, no foul. I've been wanting to try Otto's Tacos since it opened so when Kat asked me on an impromptu date Tuesday evening, I pushed for this place. Talk about Cheap Eats. Tacos are only $3 and while tiny, you probably only need 2 or 3. My favorite was the Carnitas taco, but the Carne Asada and Chicken were both worth trying as well. We also opted to share a Gorgon, which NY Mag recommended. It's not on the menu so we felt VIP knowing about it, but felt a little too full after our tacos that we just sampled a little of the huge deep-fried packed-to-the-brim carne asada, serrano-chile crema, guac, onions, & cilantro taco ($8). Go either Gorgon or tacos, but not both. Aubrey and I got our first taste of this Brooklyn hot-spot at Madison Square Eats in May, where Roberta's had set up shop in a food stall for the month. I'd heard that it was hard to get into the storefront, but there wasn't a line that day. Or, so we thought. I asked someone where the line was and he said "I think this is it" so I shrugged to Aubrey and we stood behind him. After we got our pizza, we realized that the line actually had been about 30 deep, but no one waiting had noticed when we stepped in right at the front. We split a delicious Margherita pizza across the street in Madison Square Park after getting kicked off the grass and then realizing we'd had our beers with us that weren't supposed to leave the roped-in area. Oops. I've had Mighty Quinn's a few times in my years in New York. Just recently, I've visited the location in World Financial Center, another awesome food vendor oasis downtown. Kristyn and I met for lunch and enjoyed some amazing brisket sandwiches, gossiped a lot, and talked about Full House, as we are wont to do. Red Hook Lobster Pound is another food vendor I keep returning to because, duh, Lobster. Their lobster rolls are obviously on the more expensive side of Cheap Eats sandwiches at $16 but oh my goodness, are they satisfying. Amazing meat. Amazing butter-slathered bun. Sometimes with bacon. The above picture is from a Smorgasburg trip earlier this summer. I don't eat vegetables on a regular basis. I just can't do that to my tastebuds. But DC's favorite salad place, Sweetgreen, just opened up right near my work building and I've been eating so much healthier this season because I actually *love* these salads. My favorites are the Santorini (shrimp, feta, grapes, chickpeas, romaine), the Kale Caesar (kale, romaine, chicken, shaved parmesan, the best parmesan crisps you will ever taste, tomatoes), and the Guacamole Greens (I get romaine instead of the mesclun, with chicken, tons of avocado, tomatoes, onions, tortilla chips). After George's birthday celebration on Saturday night, I couldn't help but sneak into the new Sticky's in Murray Hill that was on my way home. I brought home three large "buffalo balsamic maple" chicken fingers with shaved carrots and blue cheese crumbles on top. A glass of milk was necessary for me as they had more spice than I expected, but I was happy even so. Sticky's is open until 3 am so I see many late-night purchases of chicken fingers in my future. Next time I'll try their pretzels & salted caramel flavor. The thing to get at Artichoke's is obviously a slice of pizza with artichoke-spinach dip on top but just get one and split it with a friend. A whole slice will do you in for the rest of the night. So who wants to visit the other 91 with me? If you haven't yet seen the Comedy Central show "Drunk History" - get on that ASAP. The basic premise is ridiculously drunk people passionately telling stories of American history, which are then acted out by celebs, but always dubbed in the drunk person's voice. It's incredible in every way. This week's episode took place in NYC and we got this little gem out of it about the Statue of Liberty, which I visited with my frousins on a lovely fall day a few years back. The storyteller here actually isn't as drunk as most of the others, but he still does the job. Apologies for the language. Lately, I've been thinking a lot about Italy, partially because it's where my family was this time last year, but also because I have extra vacation days and nothing planned but a few long weekends away. Not knowing how I'm going to spend those extra days would give another Erin anxiety, but "Summer Erin" is much more relaxed and knows something will come up in due time. She will be on another adventure soon enough. Before we traveled to Italy, I made my traditional spreadsheet of places to visit and eat, all recommended by friends and fellow travel bloggers. One woman I didn't even ask for advice kept telling me that there would be a church on every corner, but not to waste my time with them. She wanted to only talk about St. Peter's Basilica and said that nothing else was worth going to. I had a feeling that this woman and I would not travel well together, so I made a note to ignore her advice. 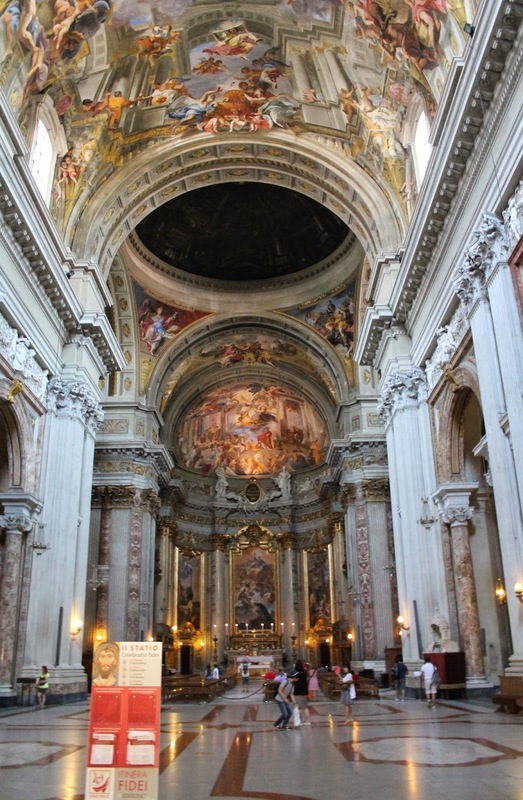 Of course St. Peter's Basilica and the rest of Vatican City are worth seeing - especially the Sistene Chapel ceiling - but the crowds were wildly overwhelming and I enjoyed other churches more. 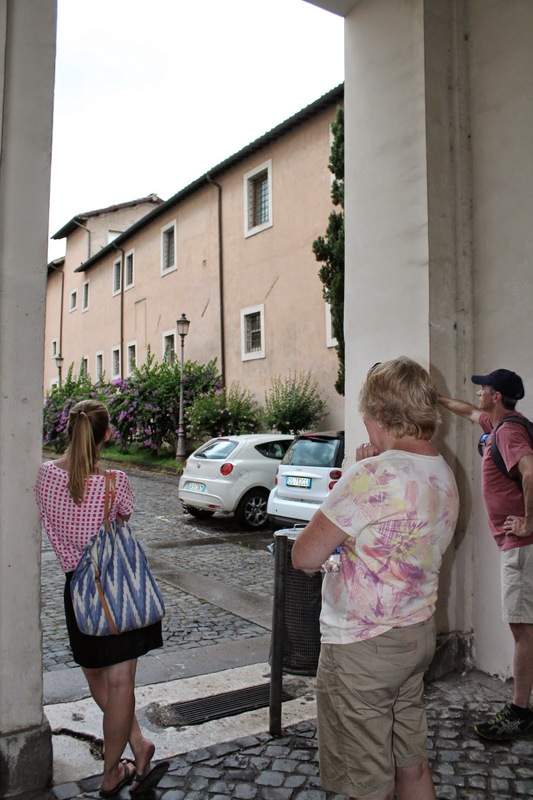 Our dear friend Rick Steves, guidebook author extraordinaire, led us to many smaller churches around Rome that had more character and felt more intimate and holy. This church was first built 1500 years ago (that is not a typo) as a home for the chains that St. Peter was kept in while imprisoned. 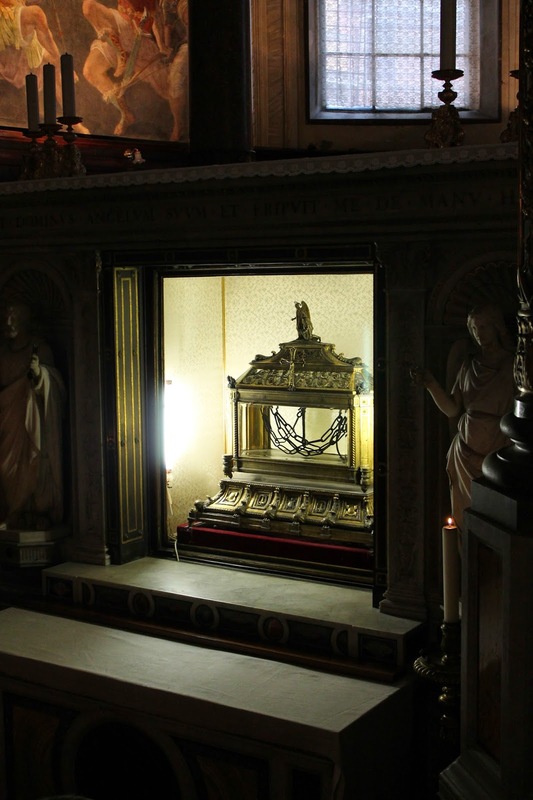 The chains are considered a holy relic and are on display in a glass case. One set of chains (from when St. Peter was in Jerusalem) was handed down through the ages until presented to Pope Leo I. When Leo placed these chains next to another set from when St. Peter was in prison in Rome, the 2 Chainz apparently magically fused together. 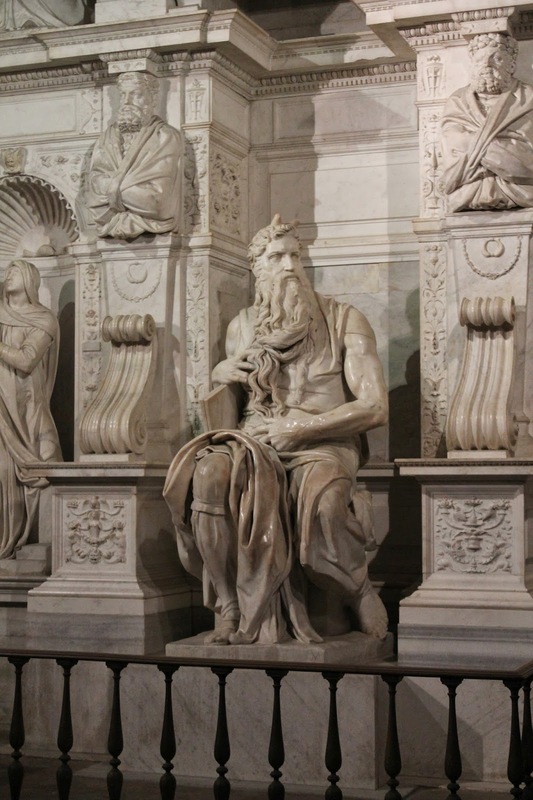 St. Peter in Chains also houses an incredible Michelangelo statue of Moses that was originally meant to be on top of Pope Julius II's tomb. It instead remains on the side of this church in darkness, lit up by machine for half a Euro. The subject of the statue is sitting, but if he were standing, he would be as tall as Michelangelo's greatest masterpiece, David. As Rick puts it, he looks like he's about to leap up at any minute to spring the Ten Commandments on his poorly behaving people. 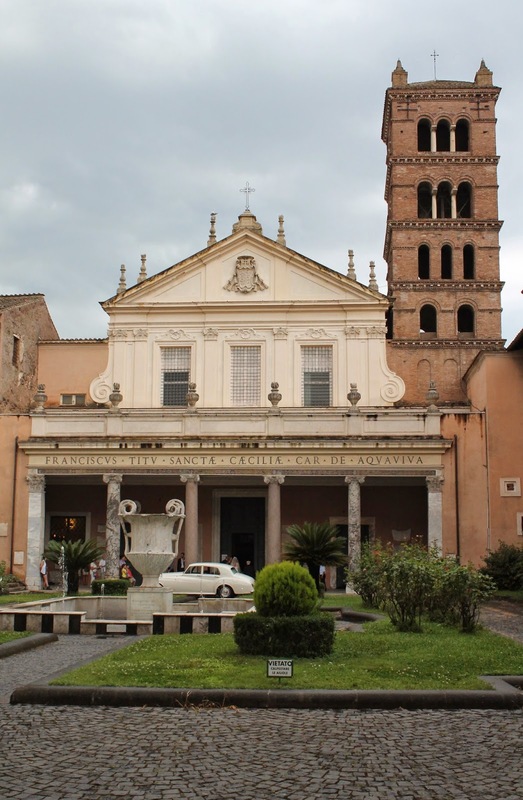 In the neighborhood of Trastevere, my family used this adorable church as an umbrella and almost became wedding crashers. When we realized there was going to be a wedding ceremony, we hung out on the porch instead of inside while it poured. It eventually lightened up and we left the porch before the bride walked in but we still caught a glimpse. There can be a two-year waiting period for weddings in this church and we did not want to be in the background of those pictures. Cecilia was an early Roman from a wealthy family who converted to Christianity and the rest of the city was not having it. She was beheaded by other Romans when their other attempt of killing her with steam from her own bath failed. This church's decorators had a good sense of humor. 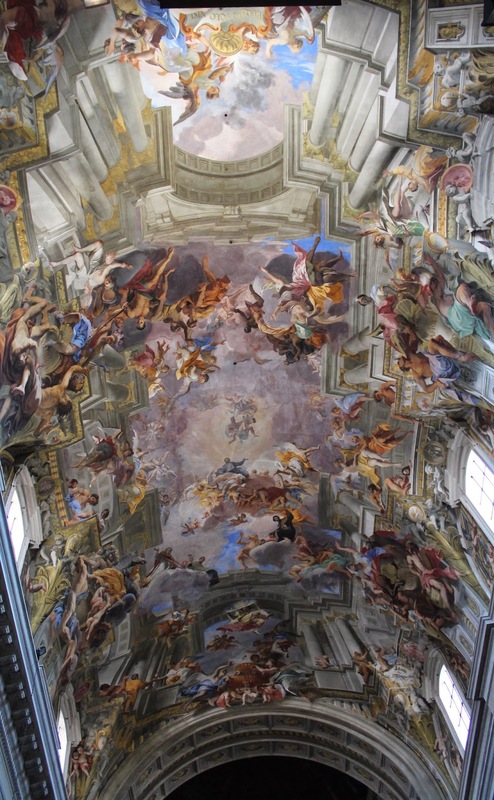 There is a lovely fresco on the ceiling that attempts to trick us into thinking that the ceiling is higher than it is. The columns of the church are extended and painted along with depictions of Christ, Heaven, and representations of the four continents of the time. The kicker here though is the dome of San Ignazio. Because it's not a dome. It's a painting of a dome on a flat surface. You wouldn't necessarily be able to tell, unless you were walking forward in the church while looking up. It's said this was done because there was just not enough money in the budget to put a real dome on top. I think this is hilarious. And innovative. 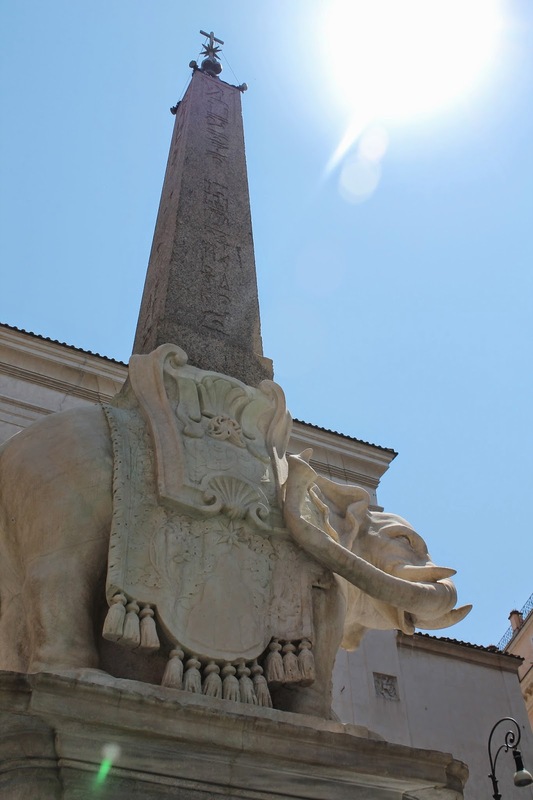 This church has an impressive elephant obelisk in the square out front. 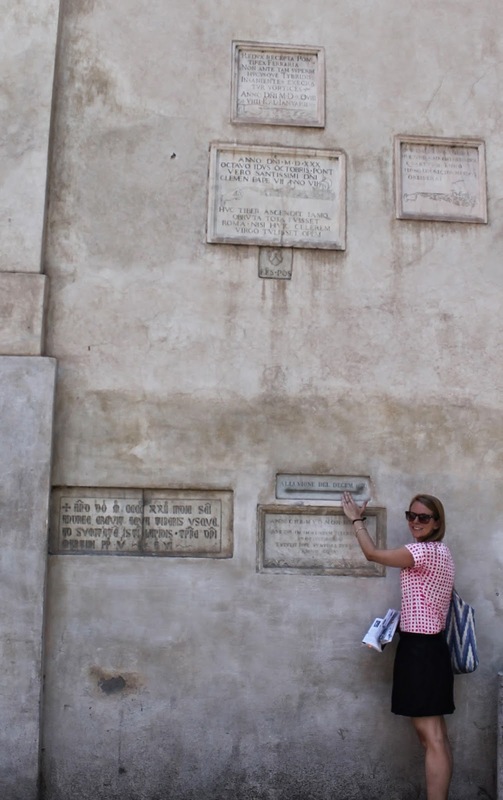 On the front wall of the church are plaques recognizing how high the waters have come in various floods over the years. But the main reason to visit this church is how close you can get to a Michelangelo. 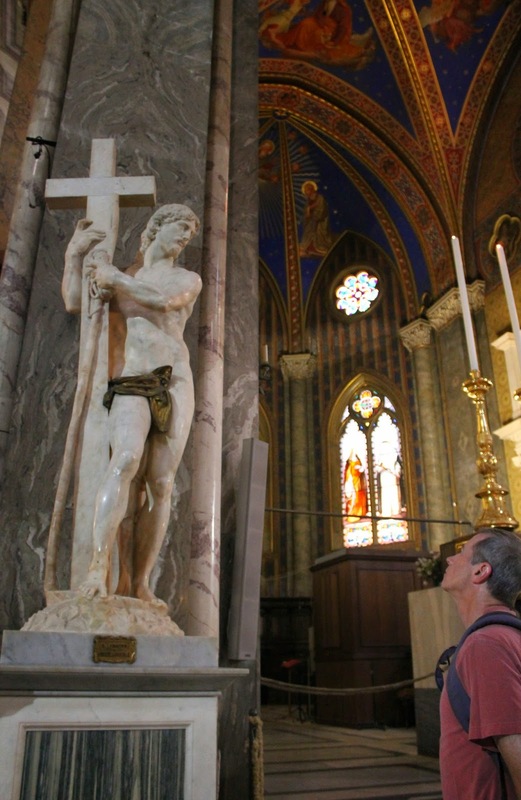 If you've ever wanted to touch a Michelangelo, this is the place to do it. NO. Don't do this ever. But be tempted here for sure by getting within inches of his statue of "Christ Bearing the Cross" displayed in this church near the Pantheon. This Jesus was originally naked but was covered up later in bronze. At the time this statue was revealed, one Roman remarked "the knees alone are worth more than all of Rome together." Yes, go to Vatican City. Schedule a tour group. Wait in line at 7 am. Shuffle through with thousands of other people. Get elbowed in the face. Get attacked by backpacks of people who forget they are wearing them who turn around quickly. Whisper things under your breath at other tourists. Feel bad because you are in a holy place but you want everyone there to stub their toes. Afterward, visit some of these other churches, where you won't need to do all of that and where you will actually feel at peace. And remember to make a wish in every new church you go into. Some of these pictures are courtesy of my sister, Katie! Grazie!